Are you frustrated with the low impact of your organization’s hiring efforts? Traditional recruitment efforts are dysfunctional and lead to unpredictable results. Until today there were no solution that could help you through the entire recruitment process. We’ve built something better. 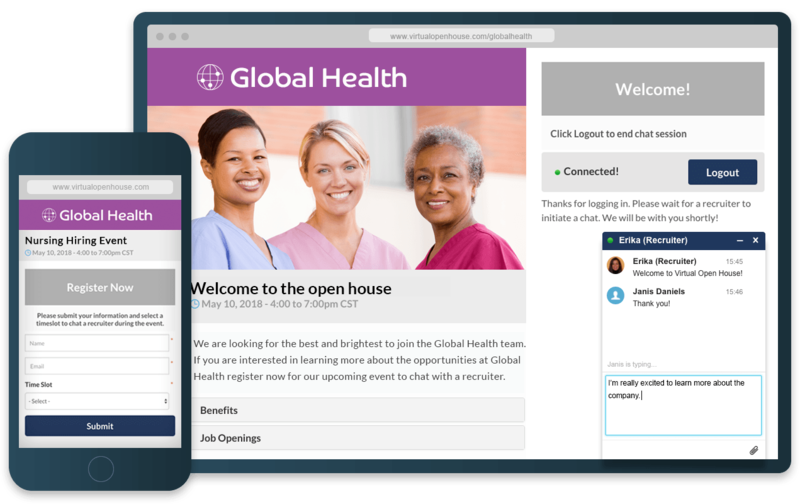 Virtual Open House is a virtual career fair platform designed to minimize the time, efforts and cost of gathering and qualifying candidates for your nursing job openings. Virtual Open House is a powerful suite of products that integrates with your existing ATS and CRM. Our business is recruitment. We’ve been helping health organizations like yours build a solid pool of human capital for over 10 years. Virtual Open House is a complete, customizable end-to-end solution to finding and qualifying your candidates. It allows your organization to build custom virtual career fairs, gather pre-qualified candidates, and use targeted events to interview the applicants using direct conversations. Sign up for a demo and see how Virtual Open House can make your recruitment process more efficient. Qualify the candidates for recruitment through direct, interactive messaging sessions. Penn Medicine has been remarkable. The product is so user-friendly and intuitive, your navigating our team through this process has been a real contributing factor to our success. The total cost of hiring and onboarding qualified nurses is very high and most hiring solutions do not scale well. We developed Virtual Open House specifically to help organizations like yours get a better handle on running and managing potential candidates. Using Virtual Open House, you can set up your own Virtual Career Fairs for a fraction of these costs. So if you are looking to streamline your hiring practices through career fairs and better applicant management, schedule a demo with a representative today. Eliminate lost opportunities, ensure a better connection to your candidates, and quickly evaluate the applicant’s fit to your organization’s culture. Let’s get you started today.